Mission Bicycle Company was formed in 2008 with a simple premise: to build the most beautiful, practical and customizable bikes on the market. 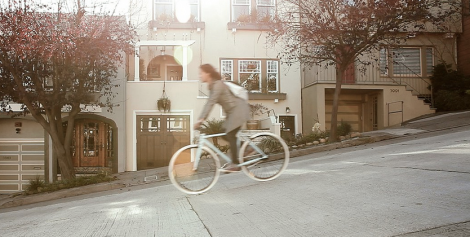 Each bike is designed by its rider and then built by hand in San Francisco, CA. Either in person or online, we'll walk you through every step of designing a bicycle that fits your needs and your personality. When we say SF Made what we mean is the coffee we brew during your design was roasted in San Francisco. We mean the staffer with whom you collaborated lives down the block. We mean every week a truck pulls up on Valencia Street to unload the highest quality components from around the world, from people whose expertise extends back decades. We mean our mechanics grease every thread, tighten every bolt, and press every headset on Valencia Street. Every email, every phone call, every admin duty happens in one building in the Mission. We mean all Mission Bicycles, every single one ever, has been built in San Francisco. The next generation of our premium city bike features 100 integrated high brightness Light Emitting Diodes. Sacrificing neither form nor function, we've built a high end commuter that increases safety and security both on and off the bike. Still custom designed by you, and starting at just $1,100. Our modified track frame geometry makes a perfect custom city bike for riders of all abilites. According to the U.S. Census we've got 99% of men and 95% of women covered. And with 6 frame sizes we've got you covered in fine incremental detail. Small, medium and large might be good enough for our competitors, but they're not good enough for all of you. Our single speed Valencia offers a simple, efficient ride at only 19 pounds. The internally geared Sutro features internally routed cables for a minimal aesthetic with full gearing versatility. Read more here. We use electrostatic powder coat instead of sprayed liquid paint because it’s far more durable. A city bike should be used. It should be locked up outside the grocery store and it should be propped against hallway walls. For all those necessary but abrasive resting places, powder coat offers protection that liquid paint just can’t match. After 6 years and thousands of frames we’ve curated a palette of our most popular colors. Those, along with the other 200+ that are available on any bike, are applied just a few miles away in South San Francisco. Browse our gallery for inspiration and read more here. Our frames were designed in San Francisco to be fun, agile, and durable. We stripped everything off — down to lightweight 4130 chromoly steel — and put back on only what was essential. Each frame is hand welded in Taiwan by an experienced fabricator specializing in chromoly steel, then reviewed and painted in San Francisco before final build. Light, strong, and guaranteed for 50 years, a Valencia or Sutro frameset is the canvas for your design. Read more here. We start with the most dependable and elegant parts available, then offer upgrades from the highest quality manufacturers around the world like Chris King, Sugino, and Brooks. The shop is our gallery of unique gear from around the world. It's also home to our design wall where we collaborate with you, one-on-one, to design your new bike. Visit to shop, test ride, rent a bike, or design your own.